Scotland will be tenuously linked to football at the 2012 Olympic Games after artist Craig Coulthard won a commission as part of the Cultural Olympiad. 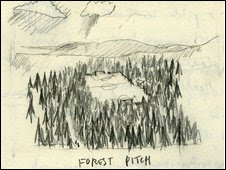 Craig Coulthard’s Forest Pitch involves a football pitch hidden within a forest. Trees are felled to make way for a football pitch and used to create a stand, goalposts and a shelter that will act as both changing room and exhibition space. One football match is scheduled to be played on the pitch, open to spectators and once the match has taken place, the pitch will be left to become taken over by nature again. The changing room is kept as a simple exhibition space to document the project. The pitch itself, with surrounding infrastructure will be taken over again by the natural world, to become a living relic of the Olympics, in contrast to the new buildings created in London for the Games. Aside from knowing what I like and what puzzles me, I don't know much about art so I won't analyse this concept further. What interests me is that this project (funded to the tune of £460,000) will leave an Olympic legacy in Scotland. The idea of a Cultural Olympiad doesn't really float my boat but it seems to be the form so why not fight for a slice of the pie. There are, of course, other legacies from the Olympics that are more important and we should be standing up and fighting for them as well. We've already endured the stramash over the football team and there is a danger of Scotland, in fact of anyone north of the Watford Gap, dismissing the 2012 Olympics as another London centric carnival, feeding the beast of the metropolis and go hang anybody else. Others will, for political reasons, shy away from celebrating a “British” Olympics. Fair enough but I doubt that even an Alex Salmond-David Cameron tag team will have jettisoned Scotland by the summer of 2012. So if it's there and we're still here let's use it for some good. I'm a sucker for the Olympics. I know there's the commercialism, corruption,drugs, money, stupid sports and let's not even mention Berlin or Munich. But there's also Jesse Owens, the Black Power Salute, Chris Hoy, Derek Redmond's father supporting him over the finishing line and dreams being fulfilled. It should inspire people and it should be at its most powerful when it's on your doorstep. The legacy it leaves can turn that inspiration into something more tangible and breed the sports people of the future. What does all this mean for football? The legacy can build sports facilities where they are most needed, facilities that can keep kids interested and make showing dedication in a cold Scottish winter much easier. Obviously better facilities are good news for football and the wider picture would suggest that turning already active children into competent footballers is going to be easier than finding a few gems in a mine clouded by obesity and computer games. So even if your heart's not in celebrating the Olympics we should all at least be making as much noise as possible to get our share of what they leave behind. At the moment each generation produces, if we're lucky, one Chris Hoy, a handful of others who raise themselves above the average and countless more who sit and watch on their TV. If the Olympics can go some way towards turning that around then I, as a confirmed watcher of TV, will think they've done Scottish sport some good. Thanks to @fromtheden for the Twitter heads up on Forest Pitch - there's more on the Straight From The Den Blog. Forest Pitch is going to be created in the Borders. In a forest I suspect. A game or two will be played before it is handed over to nature.